ProForm 590E elliptical is an affordable and full-featured elliptical fitness machine. If you’re serious about meeting your fitness goals it’s an excellent choice. Get ready to increase your fitness performance with the ProForm 590 E elliptical. This high quality elliptical is packed with features to help you get fit fast. Compatible with iFit Workout Card Technology, you can lose weight and feel great in just 8 weeks! Each card automatically adjusts your resistance and audibly coaches you through your workout. Workout cards are available in several categories to give you the most interactive and result-specific fitness options. The 590E also features an Intensity Ramp. Adjust the incline of your stride to isolate specific muscle groups. Focus your workout on your glutes, quads or calves for faster results. This elliptical is also equipped with a Compatible Music Port for iPod, 14 Performance Workouts, 6 Weight-Loss Workouts, a generous 18″ stride length and a CoolAire Workout Fan. 14 Built-In Performance Workouts: Run faster, jump higher and get stronger with 14 Performance Workouts. Each workout is designed by a Certified Personal Trainer to help you push your limits and get you ready for whatever comes your way. iFit Workout Card Technology: Lose weight, feel great and improve performance in just 8 weeks with the interactive iFit Workout Card Technology! Each card is designed by a Certified Personal Trainer and plugs directly into the elliptical’s console, automatically adjusting your resistance while the voice of a personal trainer takes you through each workout. iFit Workout Cards are available in Weight Loss, Wellness, Circuit Training and Performance categories to give you the most advanced, interactive and result-specific fitness options. Upper Body Workout with Soft Grips: Burn more calories and add muscle tone with the upper-body arms that provide a great total-body workout and increased cardio benefits. ClearView Backlit Display: Perfectly clear and easy to read, the ClearView Display has a large viewing angle so no matter how tall or short you are, you can always keep track of your workout progress. It displays your time, distance, resistance, pulse and calories burned. 1-16 Digital Resistance Levels: Digital resistance allows you to adjust your workout resistance for increased calorie burn and higher intensity. Intensity Ramp: The intensity ramp allows you to adjust the incline of your elliptical stride—forcing you to use your muscles differently. Isolate your glutes, quads and calves for faster results. Warranty: The 590E elliptical comes with a Lifetime Frame Warranty and 1-Year Parts & Labor. The ProForm 590 E elliptical is an exceptional and full-featured exercise solution that is designed to provide you with a vigorous and superior quality workout. 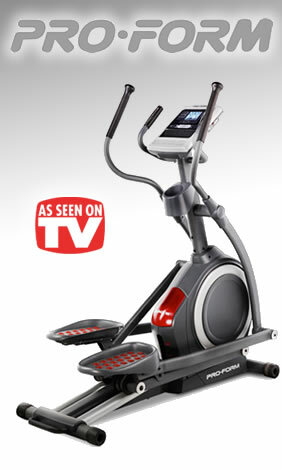 The 590E elliptical from ProForm will have you getting fit and dropping those extra pounds before you know it. If you’re serious about getting into shape and staying that way ProForm offers the answer you’ve been looking for. What are you waiting for? Order a ProForm 590E elliptical and get ready to get into the best shape of your life.